Designer - Hugo Boss. Fit - Slim. Care - Machine Wash Warm, Tumble Dry Low. Color - Blue Black. Material - 100% Cotton. Size - Large (L). HUGO BOSS POLO SHIRT SIZE MEDIUM EXCELLENT CONDITION! Type - Luka, Button Front, Woven. Designer - Hugo Boss. Size - XL - Extra Large. Sleeve - Short. Care - Machine Wash Cold. Material - 100% Cotton. Color - Black. Size Type: Regular Sleeve Length: Short Sleeve Style: Button-Front Fit: Regular Material: 100% Cotton. Designer - Hugo Boss. Pattern - Plaid. Fit - Slim Fit. Neck Type - Spread Collar. Care - Machine Wash Warm, Tumble Dry Low. Sleeve - Short. Color - Blue and Green. Material - 100% Cotton. Great condition! No stains or tears! 25" length 42" bust Purple XL Mens Check out my other name brand shirt listings for more great deals! Boss Hugo Boss Mens Polo Shirt Purple Size XL X-Large Short Sleeve Pima Cotton. Condition is Pre-owned. Shipped with USPS First Class Package. A leisurely weekend style for the modern gent. • Ribbed polo collar. • Contrasting collar, placket and cuffs in grey. Hugo Boss Cotton Shirt Orange Label Mens Blue Mosaic Long Sleeve SZ Xl Fast Ship Shipped with USPS Priority Mail Flat Rate Envelope. Just worn once Higo Boss long sleeve shirt stripes gray color !! A Hugo Boss long Sleeve Polo in excellent preowned condition! Hugo Boss thin white long sleeve henley (snap) shirt. HUGO BOSS FLORAL PRINT SHIRT SIZE XL EXCELLENT CONDITION! Color: Gray and dark blue. Get Supersized Images & Free Image Hosting. Hugo Boss Men Regular Fit XL Blue Linen Shirt Button Down Short Sleeve--New!! THIS HIGH END SHIRT IS. BUY IT NOW! •NEIMAN MARCUS. •SAKS FIFTH AVE.
Lay an item that you know properly fits on a flat surface. Pit to Pit:19.5". Top of Collar to Hem:31.5". Type - Lance, Button Front. Designer - Hugo Boss. Pattern - Plaid. Color - Rust, Blue. Size - Extra Large (XL). Care - Machine Wash. Material - 100% Cotton. Fit - Slim. When dress Shirts are S, M, L, XL, etc. This item is in excellent, Happiness condition. Nwt Hugo Boss Black Pima Cotton Polo Shirt L Boss Logo. Condition is New with tags. Shipped with USPS First Class Package. See measurements thank you for looking have a blessed day. Details:An always in style, classic Linen short sleeve shirt with side logo placard. 100% Linen. Shoulder: 20.5". Sleeve: 10". We will do all in our power to fix the issue. Well cared for preowned Hugo Boss dress shirt. And don’t forget to favorite us. We add new stuff every week! Color: Black. make Supersized seem small. Get images that. HUGO BOSS Men's Polo Style 100% Cotton Large MAROON & GRAY SS Shirt EXC!! Hugo Boss Green Label XXL Polo White, Red & Blue Striped. Condition is Pre-owned with tears in the stitching on the back. Shipped with USPS Priority Mail. Note that there may be color shade and hue variances due to different monitors and device settings. Features contrast cuffs. As shown in photos. Not noticeable when wearing. Width at bottom = 23”. A. Chest - 20" (Laying flat from arm pit to arm pit). Color - PURPLE. Material - 100% Cotton. C. Sleeve - 26". Hugo Boss - Mens Slim Fit shirt - 100% Cotton - Button Up Shirt - Size Medium - RN 73616 Shoulders 18” armpit/armpit 20” length 27” neck/cuff 32” Excellent condition! 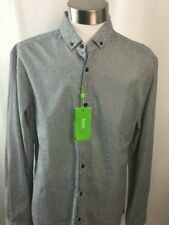 Up for sale Hugo Boss Orange Mens Button Down Shirt Slim Fit Green Long Sleeve Size Large Like New! RETAILS FOR: $248.00 WHAT’S IT DO? A business-ready shirt crafted in pure Italian cotton.